and a tray of caprese bites. These were my favorite! Halved cherry tomatoes, basil, and ciliegine (cherry-sized mozzarella balls) held together with a toothpick on a tray drizzled with olive oil and lightly sprinkled with salt and pepper. They were so easy to serve and a fun idea I will use again! For the main course, we had chicken alfredo pasta (my husband's selection) and cheese tortellini. I have to confess, we brought those in from a local restaurant. C'mon! I have a 1 year-old and a 3 year-old! I did the best I could! :) Sorry, but I forgot to get a photo of them. I did make some amazing garlic cheese bread (thanks to the recipe over at Chindeep). I made some modifications - which I will share later - but her original recipe is great!! and my Olive Garden Salad. The cakes were beautiful! We got them from Whole Foods because I am not very talented when it comes to cake decorating. I love the Whole Foods cakes because you can choose to have organic fruit filling inside, and they will make an adorable smash cake for the birthday girl! She loved the cake! :) I apologize for the gruesome nature of the photo. I took a bad fall with the birthday girl in my arms. I tripped over a riding toy on our concrete backyard, and fell straight back clutching her as tightly as I could. I slammed my head in the ground and she began to scream. My sister-in-law quickly grabbed her and took her inside to get a better look while I tried to get up. We soon discovered she had a bloody nose and my head was killing me. 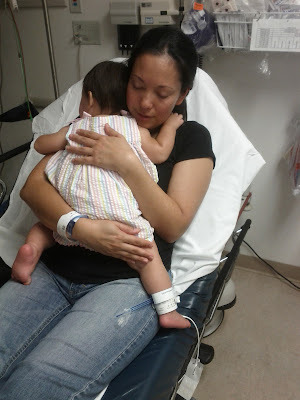 Fearing a broken nose for the baby and a concussion for me, my husband wanted to take us the the ER. So this is how we ended our night. Luckily, she was fine and I did not have a concussion. I am still pretty banged up with scrapes, bruises, and a very sore right elbow and neck. It was certainly an eventful birthday filled with family, great food, fun, and a little extra adventure. Hopefully she will only remember all the good stuff! Wow! What an eventful post! Happy birthday to your sweet little one and thank goodness you're both alright :) I love all the party food you made and what an adorable cake!! Ohhh...that's so too bad about your fall, but you did exactly the right thing to protect her at all costs, before even thinking of your own possible injuries. That's beautiful - Bless you for that. Glad there was no really lasting problems, be all better soon. Glad to know about your first birthday party. Couple of weeks ago, I arranged my niece’s baby shower at one of elegant Chicago venues. Decorated venue with beautiful flowers and everyone liked these arrangements. We all had great time there.